Trappro humanely removes snakes that have gained access to your house, attic, walls, barn, roof, chimney, shed or other areas of your home. Snakes will be trapped and removed. Snake skins and other messes made by snakes will be safely removed from walls, attics, sheds etc. Dead snakes or baby snakes will also be carefully removed if found in your home in Maryland, Washington DC or Northern Virginia. Description: Snakes are long, footless reptiles that feed on small mammals and insects. They have no visible eyelids or visible ears and are covered in overlapping scales; patterns vary from species to species. Snakes rely on smell & vibration rather than sound to both go after prey and protect themselves against predators. A snake's skull is significantly more complex than your average reptile; this is to accommodate their large prey and make digestion a swift process. Snakes range from 10 cm in length to as large as 30 feet long. Most species of snakes are non-venomous (milk snake, black rat snake, garter snake); killing prey by either live consumption or strangulation - but snakes that do eject venom (copperheads, water moccasins) can certainly pose a danger to humans & other wildlife. Aside from Antarctica, and a select few smaller land masses - snakes are found on every continent in the world. Food Sources: Snakes are strictly carnivores - feasting on birds, mice, rats, insects, lizards, fish, and even the eggs of these young. The body size of a particular snake will dictate its food sources; the larger the snake, the larger the prey. Snakes are unable to tear their food in to pieces. They are equipped with a specialized skull structure which allows for immediate consumption of live, whole prey. As stated earlier, some snakes are able to inject prey with venom to ingest, while other snakes must suffocate or constrict their prey for ingestion. Life Span & Reproduction: Weather dictates much of the snakes breeding habits. Colder climates simply don't facilitate snake breeding while warmer climates can allow snakes to breed year round. 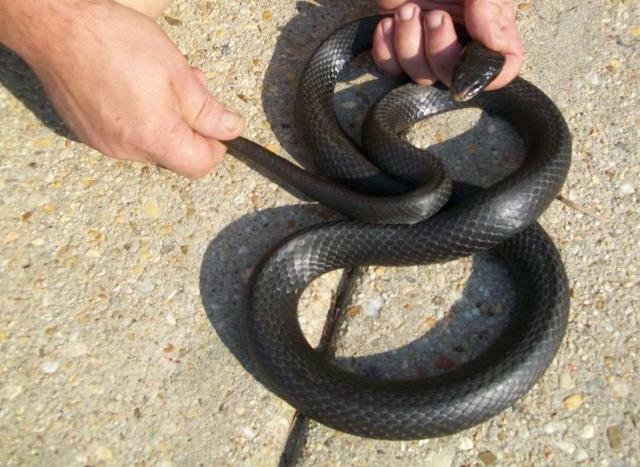 Snakes in the Maryland, D.C. & Virginia areas will be most likely to reproduce during the early spring and throughout the summer months and maybe even in to some of the early fall. Once temperatures become colder, breeding patters usually teeter off until warmer months. Typically, once a male has fertilized the eggs of a female snake, incubation takes anywhere from 2 to 5 months, and this may occur in or outside the female snakes' body. Some species of snakes carry the eggs with them inside their bodies until birth occurs while other snakes lay eggs almost immediately after fertilization. Snakes often shed their skin for growth and hygiene purposes. Shedding of the skin allows for further growth of these creatures, and it also rids the snake's exterior of all previous toxicities. Snakes lifespans vary from species to species (largely dependent upon size) but range anywhere from 3 to 40+ years. Typical areas of entry: Most snakes enter at ground level because climbing is not facilitated with their bone structure, but trees can be a useful form of transportation for them to the roof line of a home. Any spaces/openings around water, gas, oil pipes or utility lines, open crawlspace vents or electrical outlets, window & door thresholds, and a variety of other open areas. Once they have claimed territory indoors, snakes will travel through insulation in walls & ceilings, inside and behind cupboards, appliances, bath tubs & shower stalls, and also near sources of heat such as basements, attics, furnaces & heating systems, especially where things are stored. Typical Treatment: Usually snake entry is the result of rodent infestations. Snakes will typically enter structures and homes chasing after prey. Snakes also enter seeking warmth in the colder months, but are typically extremely afraid of human contact. Reducing the amount of food source entry can reduce the amount of snake entry. Trappro's inspection will reveal where the snakes & their food source are gaining entry; we will provide a comprehensive proposal to explain which areas are of concern and how Trappro can permanently close off these open areas. Upon the inspection, Trappro can also place live snake traps (snake sized glue boards) to catch snakes roaming throughout the inside of a structure. These traps are scented, to attract the snake(s), and once a snake has been caught - he can be easily released if favored. Sealing up points of entry and maintenance of traps (both for snakes & their food source) is your best defense at excluding these forms of wild life altogether. Call Trappro TODAY! and have your snake intrusion on the road to resolution. Dangers: The largest danger with these creatures is that some can be venomous; a venomous snake bite can end a life. Snakes have teeth that are replaced throughout its life - snakes could also bite or attack if they feel threatened. Snake bodies can also become homes for a large number of parasites (tapeworms, round worms, mice, ticks, fleas etc.) and these organisms are easily transferred to humans or other animals. Our professional trappers will also be able to seal up holes in attic or walls including fireplaces and vents where snakes have entered the home. Trapping and exclusion of snakes is available for homeowners and business owners throughout Maryland, Washington DC and Northern Virginia.